September 22, 2009, Barcelona, Spain – Paul Bonhomme, who has won two of the last five rounds in this year’s Red Bull Air Race World Championship and come second in the other three, could clinch his first title next week in the final battle of 2009. He opened a four-point lead over defending champion Hannes Arch of Austria with a resounding victory on 13 September in Porto. The British ace has been virtually unbeatable since the penultimate race of the 2008, where he threw away the title with a heart-breaking result. But Bonhomme said as painful as it was to finish 10th in Porto last year, it turned out to be watershed moment that helped him bounce back in style with a hot streak that includes two pressure-packed victories in the last three races. Bonhomme, who celebrates his 45th birthday today alongside his rival Arch who turns 42, has been on a mission ever since. He climbed to the top of the standings this year with a career-best 55 points out of a maximum 65. He also has two 2009 victories in the five races even though his plane was clearly not the fastest for the first four races. 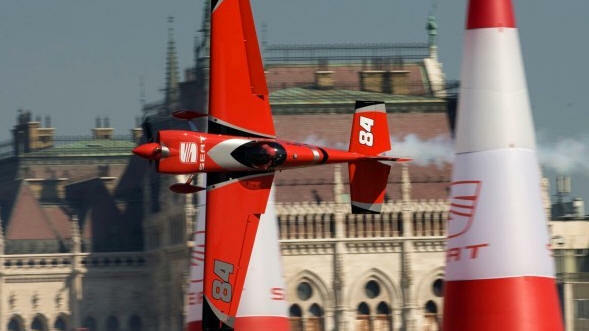 He trailed Arch and his superior airplane through the first half of the season before taking the lead in round four in Budapest, where the Austrian fell to a season-worst fourth place. Arch only beat him once (Abu Dhabi) in a race going back to the 2008 finale in Perth even though the Austrian was often faster in training. Bonhomme, famous for taking his afternoon tea break at the Red Bull Air Race Airport, said he well understands the pressure of the final race after having come up short in the final battle for the championship in 2007 and 2008. Despite finishing second to Mike Mangold in 2007 and Arch in 2008, he is confident 2009 will be his year. “I think I have a massive advantage,” Bonhomme said, referring to the experience and good track record flying under pressure. “As we’ve seen in recent races, Hannes can make mistakes under pressure.” Indeed, after his strong start this year, Arch stumbled with costly penalties in the finals at Windsor and Budapest whereas Bonhomme has rarely made a race error this year. The fact is that Bonhomme is on a roll with 35 points out of an available 39 from the last three races. He also believes that along with a shorter gap between the last two races – unlike a two-month break in 2007 and 2008 – should also work in his favour. Bonhomme said he will be focused on flying well and winning the race in Barcelona, and is not going to think about the championship until after the race is over. He is looking forward to the challenging Barcelona track.